Governor Hindmarsh Hotel, Fri 16 Mar. 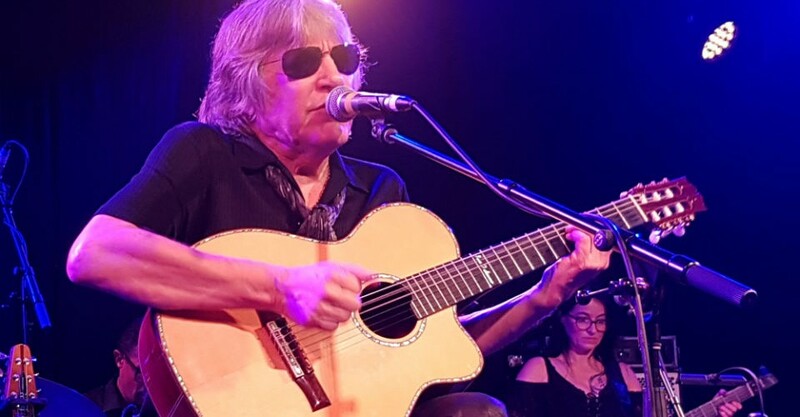 For well over three decades Feliciano has enjoyed continued worldwide radio airplay, and local fans packed The Gov to show their support and love for the 72-year-old Puerto Rican born legend of guitar and song, the one and only José Feliciano. In a prolific career spanning over 50 years and exceeding 65 albums, this year sees Feliciano release As You See Me Now, co-written with Jools Holland, BBC presenter and musician, and thus far the album has been well received. Feliciano’s support act, Jelena Kristic, Serbia’s ‘queen of song’ as the manager informed me, delivered an energetic set with powerful vocals and great stage presence, and certainly lived up to her description. The band looked like they had fun, and this is always a great way to start a night! Kristic and the band were also there to support Feliciano, and provided driving grooves and excellent harmonies when needed. There’s a certain flavour that is distinctly Feliciano: smooth, emotive and wistful vocals, lightening-fast melodic guitar passages, Latin-infused ‘comping (chord accompaniment) rhythms, and a hint of jazz and flamenco thrown in for extra spice. Guided carefully on stage by his son, (who also capably played drums for a couple of songs), vision impaired Feliciano seated himself comfortably on a stool with right foot raised in classical guitar position. The epic 90 minute long set started with the iconic ‘60s classic California Dreaming, chilled out, medium paced and groovy. As the set continued Feliciano played a contrasting blend of selections from Beatles, Michael Jackson, Bee Gees, Dylan and Extreme, and of course Feliciano’s own compositions, both old and new. Feliciano generously traded solos with his suburb and tasteful guitarist, Ulrich Ellison. The whole band was wonderful, adding just what was needed and never overplaying. My personal favourites were his mellow arrangement of Light My Fire and the exhilarating Gypsy King penned, Bamboleo. Despite appearing frail and arthritic as he walked on and off stage, Feliciano’s hands showed no signs of discomfort as his fingers fluently fired across frets, and looked as nimble as one 60 years his junior. Feliciano’s banter is warm and he has some endearing and very funny stories…but some of his ‘dad’ jokes…well, let’s just say there were a few groans! That aside, the diminutive-framed Feliciano has a delightful, well-seasoned charm and manner on-stage, and clearly a genuine reciprocal love for his fan base. Speaking of which, some of his Latino fans were enthusiastically vocal and direct about what they wanted to hear – one of his signature tunes, and this was the one that Feliciano saved until the end, and then it was all over, Que Sera. An evening with a Latino master.